Photo courtesy of Montgomery County Government Press Office. 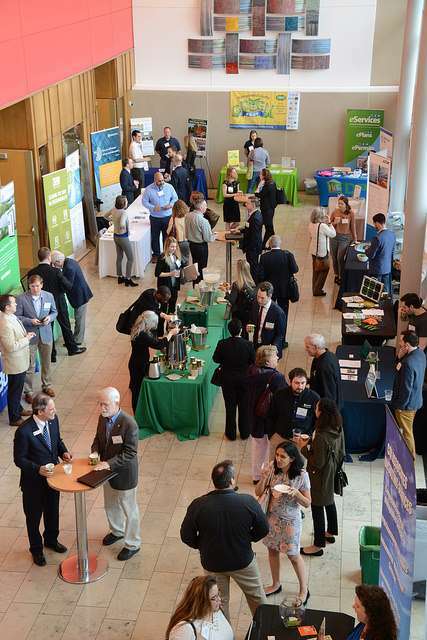 What a great way to start Earth Month – with the Montgomery County Energy Summit on April 4! We applaud the County for this endeavor and were so pleased to be able to contribute as a sponsor to this Summit, which took place at the Silver Spring Civic Center. Such a terrific chance to hear County Executive Ike Leggett and Jeffrey Abramson of Tower Companies speak on leading the County toward an energy savings future. We thoroughly enjoyed the opportunity created by the Summit to engage with a wide variety of energy stakeholders from across the County on new and progressive approaches to managing energy. We saw many good energy savings products, interacted with for-profit and nonprofit energy service providers, and were able to participate in important discussions on ways to achieve the County’s energy goals. Wide-ranging topics included strategies for multifamily units, financing solar, data management and working with property managers and brokers to drive energy efficiency in buildings. Board members Bonnie Norman and Bob Sahadi joined me to give a presentation on green banks. Throughout the day, we repeatedly talked about the role of partnerships. Partnerships are so important in advancing the cause of clean energy and energy efficiency, especially at the local level. Since last year, we’ve been working hard to bring our first financing product to market, and in March – just in time for this year’s Summit – we launched the Commercial Loan for Energy Efficiency and Renewables (CLEER). CLEER is designed to support for profit and non-profit business and commercial property owners in the County in making energy efficiency and renewable energy improvements to their properties or businesses. The tools, connections and resources we offer make it easier for businesses, commercial owners and nonprofits to undertake these kinds of improvements to their properties. Special features of this loan program – such as no collateral requirement – are possible because of the partnerships we built with two lenders, Revere Bank and Ascentium Capital LLC. And then to achieve results, we rely on the partnerships we are forming with experienced commercial energy-improvement contractors. We’re happy to say that our initial roster of authorized contractors is expanding with more coming on board each week. These lender and contractor partnerships, together with the initial and ongoing support of the County, the Montgomery County Department of Energy (DEP) and other stakeholders, enabled us to provide an offering this year alongside other Summit participants. For us, it was a milestone event just from that perspective. Now five years strong, it has become quite clear that the County’s Energy Summit is key to successful clean energy actions in the County. The Summit brings in a broad set of participants from the County, state, and the federal governments to drive attention to achieving large-scale energy transformation. Although the theme of this year’s Summit was incremental steps, the energy at the event demonstrated the tremendous commitment and enthusiasm that lies behind a local shift to clean energy and energy efficiency. This commitment is one more thing that helps make Montgomery County a great place to do business, work, and live. We at the Montgomery County Green Bank felt privileged to be a contributor this year and are already looking forward to next year’s event.